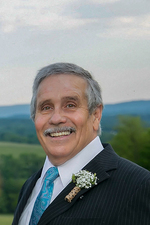 Paul Rinkus Obituary - Shrewsbury, Massachusetts | Britton Funeral Homes, Inc.
Paul Francis Rinkus of Shrewsbury, MA died on 11 April with his loving wife, Sharon, by his side. He leaves behind his son Christopher and his wife Stephanie; son Alexander and his fiancé Katherine; and his beautiful granddaughter Charlotte. Born in Madison, Wisconsin and raised in Albany, New York, by Louis and Mary Rinkus, Paul was an outgoing, gregarious soul throughout his life. He graduated from Clark University in 1971, where Paul and Sharon spent as much time at concerts as in class. Together, they discovered lifelong friends and a love of music, while building a life together in Massachusetts. Paul lived most of his life in New England; a fitting place for his resourceful spirit. Winter was no barrier when the siding needed to be painted. When a new deck needed to be built, he taught himself how. He loved working on his home and his family appreciated the productive outlet for his stubbornness. His career reflected the breadth of his personality: a sound engineer for rock bands, a sales trainer for Digital Equipment Corporation, and a small business owner at Fitzgerald-Rinkus Insurance. Given the chance, Paul could connect with anyone. All who knew him will forever remember his endless stories, boisterous charm, and conversations peppered with Churchill stories. His final months were difficult but his spirit indefatigable. His family thanks Dr. Giles Whalen and his team along with the staff of 3West at UMass Memorial Hospital for their tireless support. Funeral services will be held on Saturday, 21 April at Britton-Shrewsbury Funeral Home at 648 Main Street in Shrewsbury. A visitation hour will be held from 1-2 PM for condolences. Services will begin at 2 PM; Attendees will be invited to share stories of their time with Paul and celebrate the spirit that remains with us all.